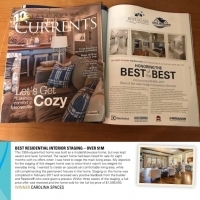 Carolina Spaces was featured in the article "Honoring the Best of the Best" in the January 2018 issue of Lake Norman Currents magazine. 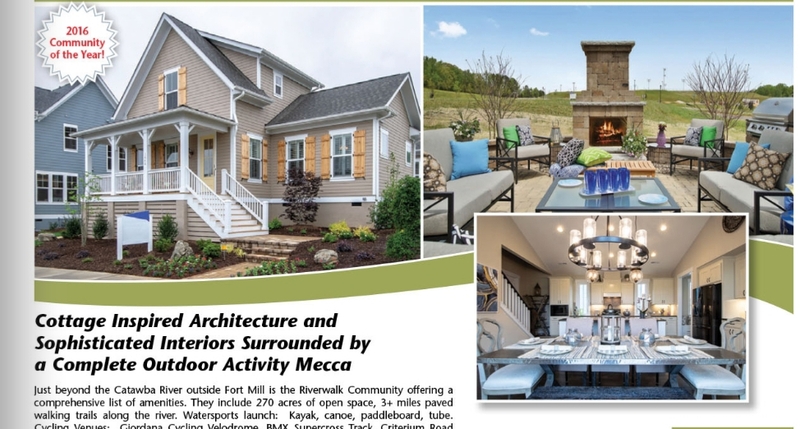 The article highlighted the winners of the 2017 Lake Norman Home Builders Association's Best of the Lake Design Competition. 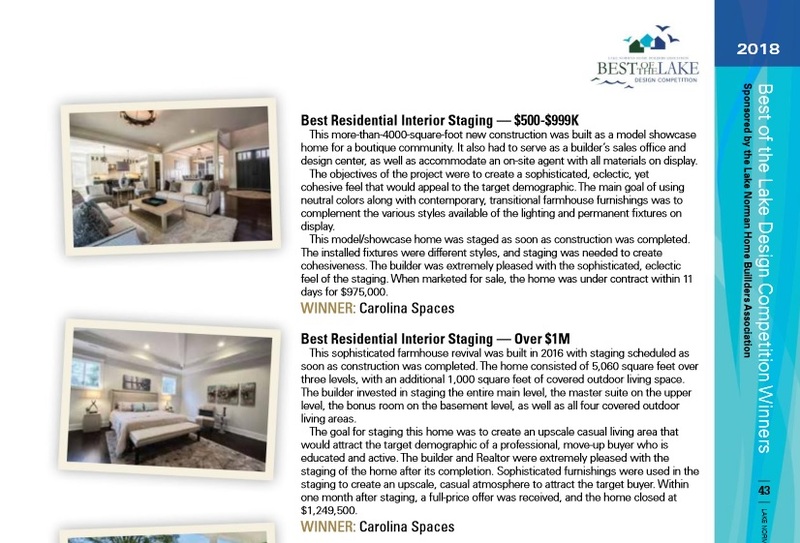 Carolina Spaces was awarded Best Residential Interior Staging of a Luxury Property valued over $1,000,000 for the third year in a row. 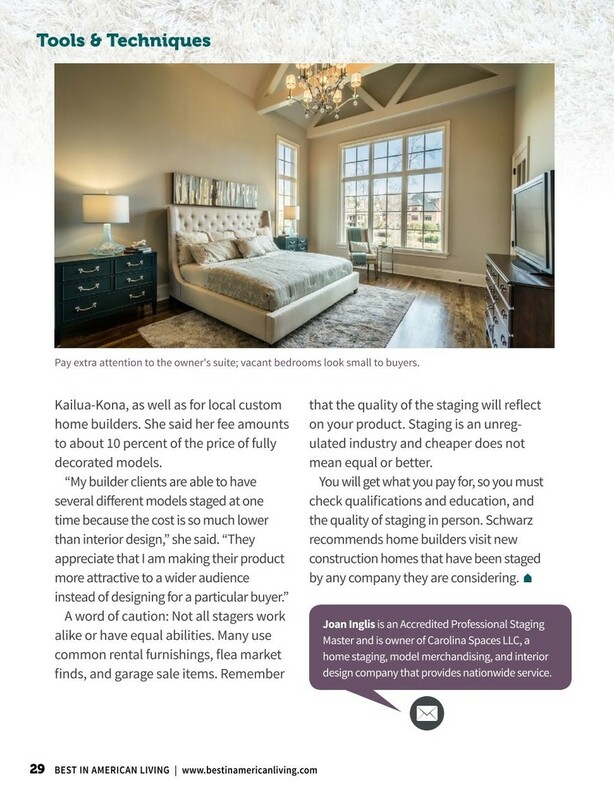 Joan Inglis, Interior Designer and Accredited Staging Professional Master®, had the honor of discussing her passion for interior design with Carolina & Co Live at the Myrtle Beach Fall Home Improvement & Outdoor Living Show last week! View the entire interview at blogspot.com. 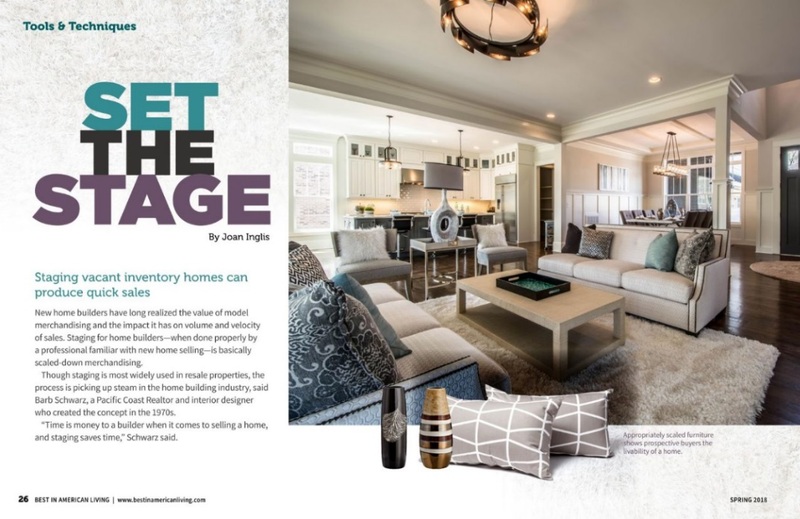 Joan Inglis, Interior Designer and Accredited Staging Professional Master®, is the owner and lead designer of Carolina Spaces, a full-service home staging, luxury home staging, model home merchandising and interior design firm based outside of Charlotte in Lake Wylie, SC. 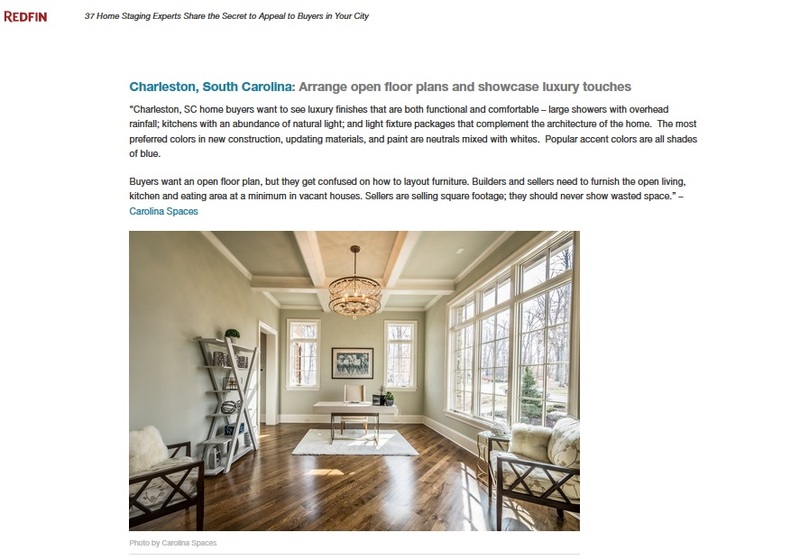 Carolina Spaces provides services to the Charlotte, NC region and throughout the Southeast. 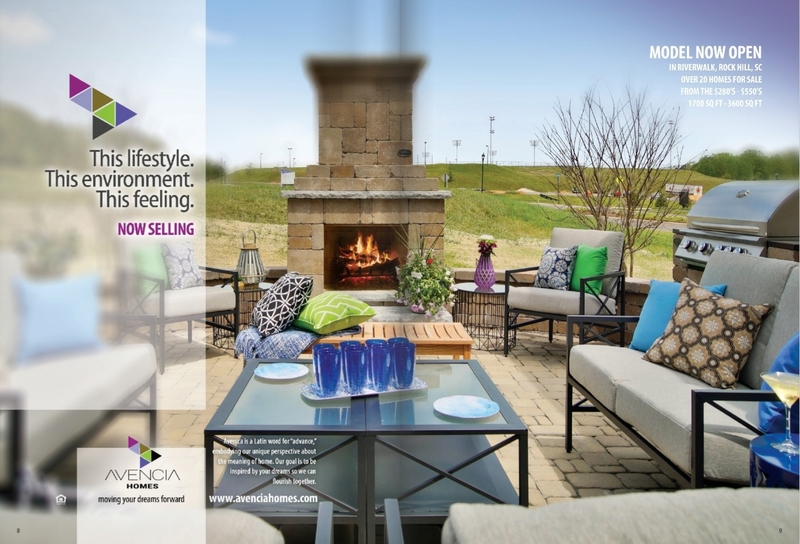 Call 1-855-SPACES-5 or Contact Us for more information on our award-winning services. 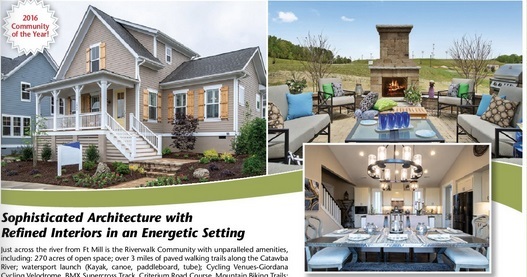 Joan Inglis had the honor of presenting two seminars at the 2017 Fall Home Improvement and Outdoor Living Show at the Myrtle Beach Convention Center. 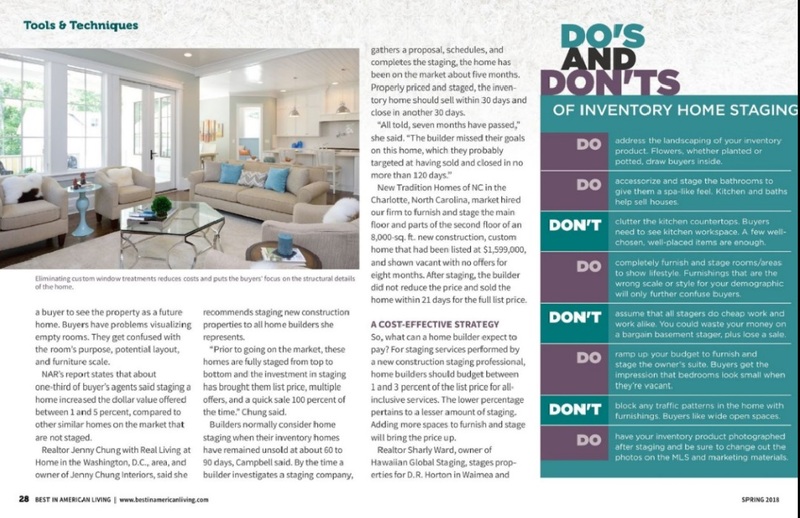 She also had the opportunity to share a sneak peek of her presentation "Update Tips to Add Style and Value to Your Home" with WBTW News 13 viewers and provide some DIY tips too. 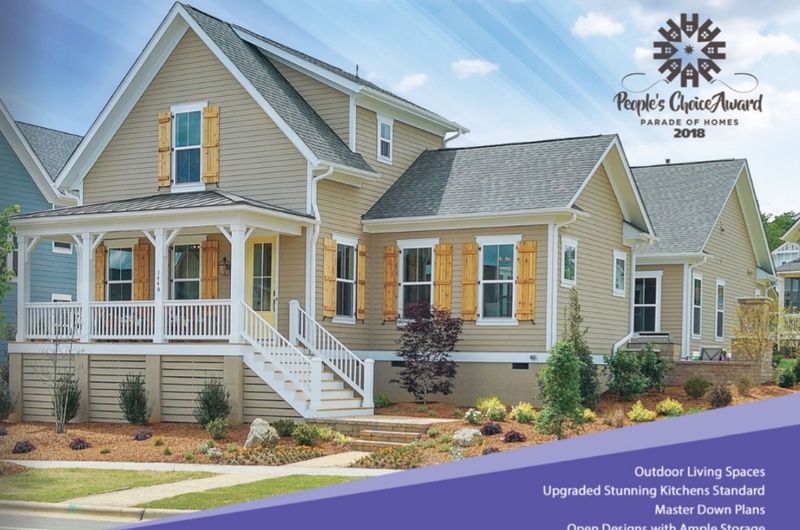 What are the safest colors to use on big-ticket renovation projects? 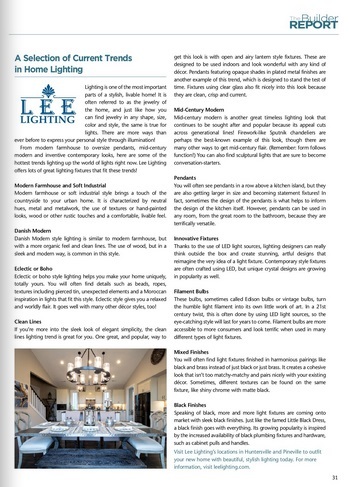 Begin all projects on permanent fixtures in the house (like tile, hardwood, and cabinets) with streamlined colors – the timeless colors – black, white, brown, and tan. What if we’re just looking to update the look of a living room? Light-colored furnishings are really popular. Instead of going stark white with upholstery, look for cream or gray fabrics. Then use an accent color or two in art, pillows, and accessories. Keep the color flowing throughout the room. What can we do to make our bedroom more inviting? Replace your light fixture with a chandelier; clear away all clutter from nightstands and chests; and add a plush rug under the bed. 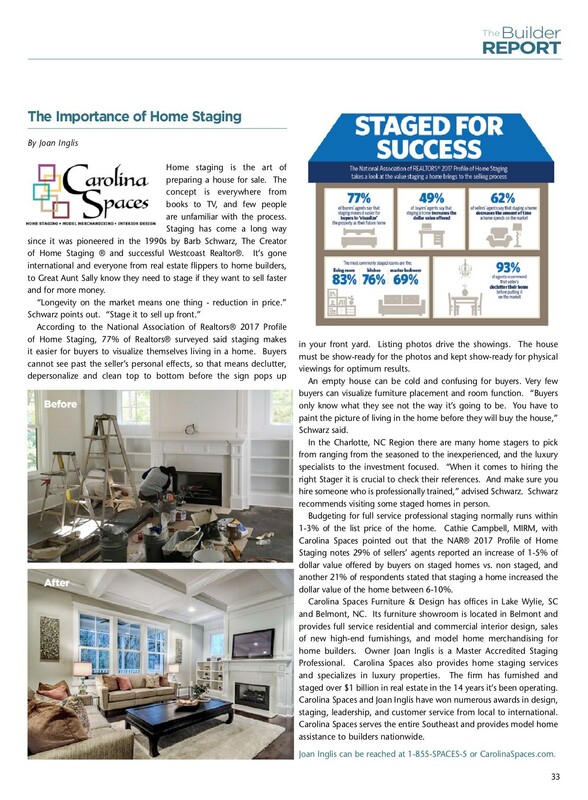 Joan Inglis, Interior Designer and Master Accredited Staging Professional®, is the owner and lead designer of Carolina Spaces, a full-service home staging, luxury home staging, model home merchandising and interior design firm based outside of Charlotte in Lake Wylie, SC. 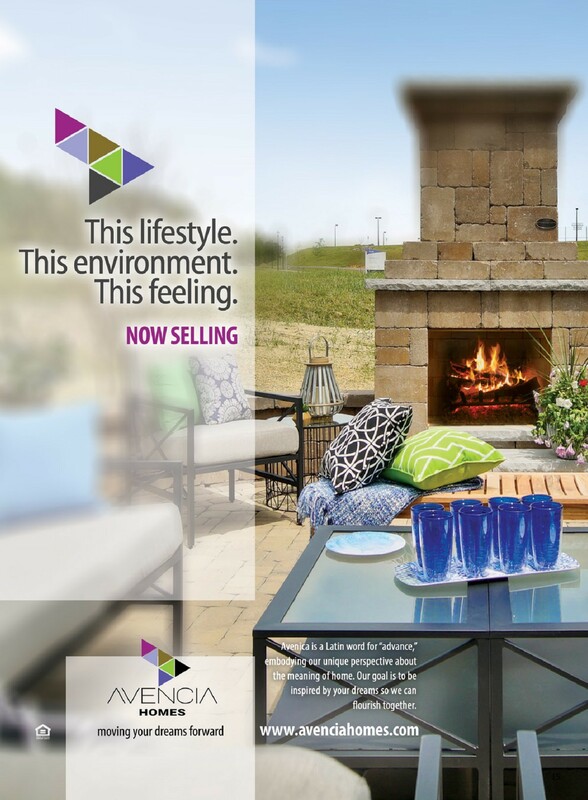 Carolina Spaces provides services to the Charlotte, NC region and throughout the Southeast. 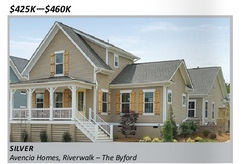 Call 1-855-SPACES-5 or visit CarolinaSpaces.com for more information on our award-winning services. 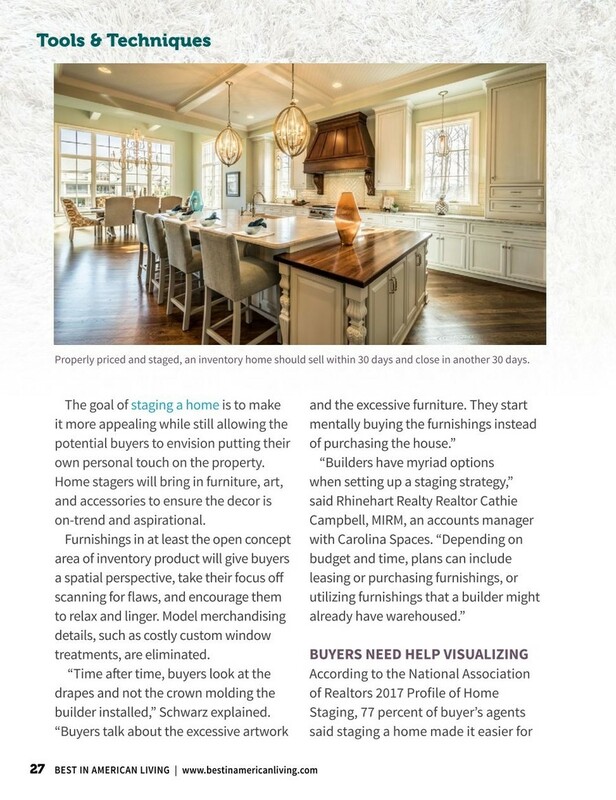 Joan Inglis, leading Accredited Master Home Staging Professional® in North and South Carolina, was featured in the January 2017 issue of Lake Norman Currents Magazine. 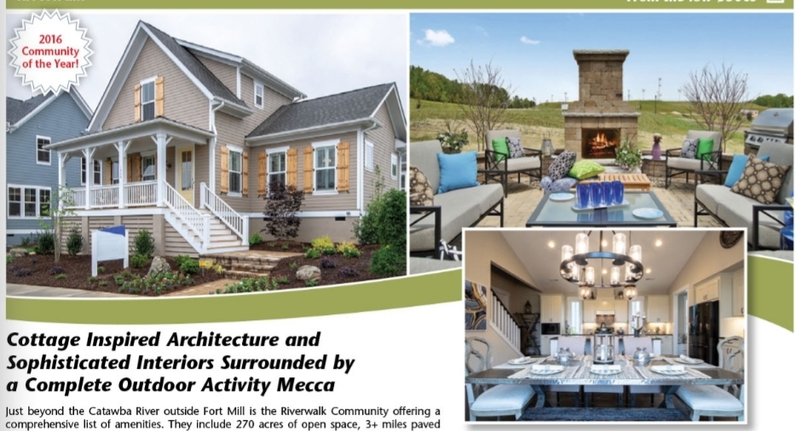 Joan provided her expertise to New Year, New Home - Your 2017 Home Forecast where she discussed colors and design styles that are trending for 2017. Joan Inglis has been featured dozens of times on TV, online, and in print. 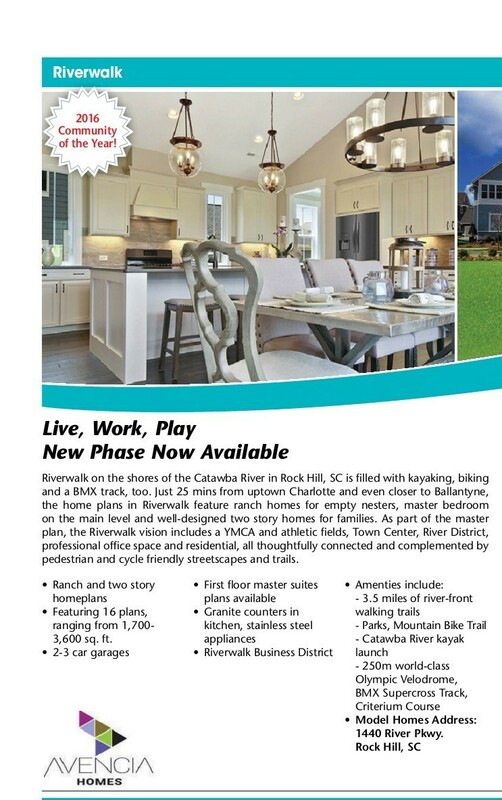 She has won numerous state, regional, and local awards since forming her company Carolina Spaces in 2004. 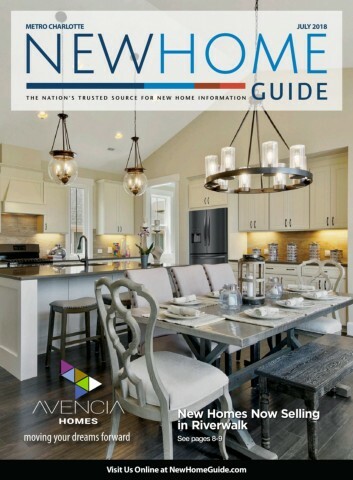 Joan reigns as the Charlotte Region's leading expert in Home Staging, Model Home Merchandising and Interior Design. 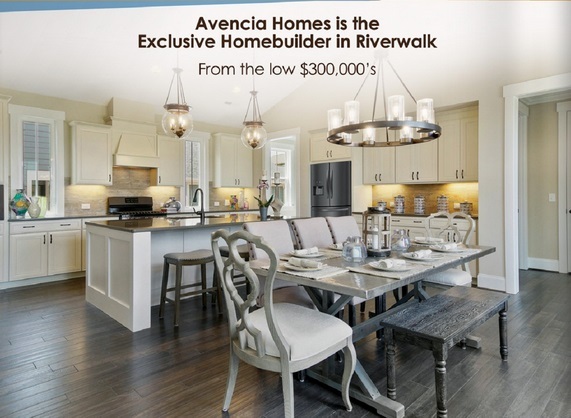 Joan provides professional presentations and speaking engagements to enhance educational programs for Realtors®, home builders and investors. Contact her at 1-855-SPACES-5 or www.CarolinaSpaces.com.